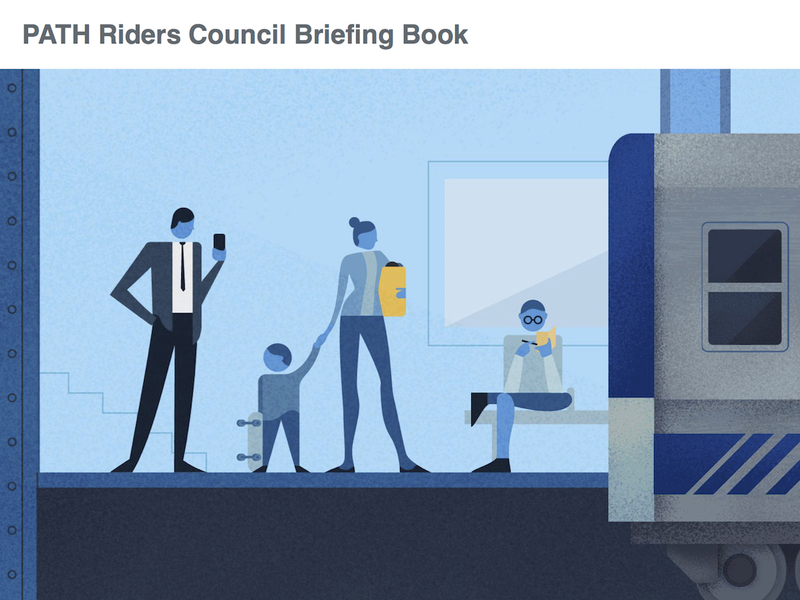 I have led the Port Authority of NY & NJ into a new era of engagement and collaboration with customers by establishing and leading the PATH Riders Council (PRC), the customer advisory board for the rail system connecting New York & New Jersey. Through my work as chair of PRC, I have built strong working relationships with all three key transit agencies in the New York metro region, as well as elected officials, policy staff, and departments of transportation in New York, New Jersey, and Connecticut. PRC’s accomplishments under my leadership include: an updated service map with regional transit connections in all 350 PATH train cars, increased service frequency to meet changing ridership needs, and collaboration with the MTA to provide 2-trip Metrocards for use on NYC Transit during PATH service outages for capital construction. I also guided design and testing of the RidePATH mobile app, improved social media alerts and customer responses, and advised on messaging and community outreach for the addition of an elevator at Grove St. station, a key project to increase ADA compliance and improve access for customers in Jersey City. Working with PRC, PATH updated the line map displayed in 300+ train cars to show regional transit connections at or near each PATH station. By showing PATH customers their connecting options, this new map helps people travel using all available transit connections, and moves the region closer to the more comprehensive awareness of regional transit that I am advocating for with the New York & New Jersey Subway Map. The updated PATH line map is a tangible improvement that will benefit riders with greater awareness of transit options in the NY & NJ urban core for years to come. This photo shows the updated line map in a PATH train car. The map displays regional transit connections at each station. I shared the updated PATH map at the Port Authority Board of Commissioners public meeting to highlight collaboration between PATH & PRC, and emphasize the value of giving customers comprehensive information about transit. Heading home from work? Heading out for a night on the town? The new RidePATH app for iPhone & Android offers real-time train status before you enter the station. PATH Riders Council, PATH, and the Port Authority technology team worked closely to ensure that PATH’s official app offers information and tools that help customers have a great experience on PATH. You can use the app to check train schedules by station – even when underground, get line and station-specific PATHAlerts as you approach a station, set your favorite stations so your typical trip schedule is quickly accessible, find the PATH station closest to your current location, and view the PATH service map with regional transit connections. PRC and PATH have worked together to adjust PATH train service to meet changing ridership needs. As working patterns change, ridership statistics indicated rising demand later in the evening peak, so we we adjusted evening peak train schedule so train service operates more frequently throughout the 7PM hour to make transit easier and more convenient for riders. We also increased service during the 5-6AM hour on the Newark-World Trade Center line. This required working with multiple divisions to accommodate overnight maintenance and track work, and ensure train equipment and crew availability. The increased early-morning service is beneficial for people heading to work at that hour, returning home after an overnight work shift, or catching an early flight from Newark Airport. PATH is engaged in a multi-year project to modernize the signal system that governs train movement. The new signal system will increase safety, and enable up to a 20% increase in service, which will help PATH accommodate growing demand. Although disruptions can be inconvenient, the work underway is essential to the performance, capacity, and resilience of the transit systems that power the urban economy. Over the past several years, PATH service has been suspended in segments of the subway system connecting NY & NJ on weekends to give crews the longer time blocks necessary to make major repairs and upgrades. PATH announced the 2016 service changes to give riders two months’ notice, a notable improvement over the announcement of 2014 closures, which was criticized for giving riders only about a week’s notice. In our regular meetings with PATH, the PATH Riders Council discussed the importance of a longer advance notice period for future service changes, and the earlier advance notice is a good outcome of that collaboration. The interplay between transit capacity and real-estate development is an important issue facing cities. PRC has focused on this issue as neighborhoods served by the subway connecting NY & NJ see increased residential development, and the resulting population growth has led to significant PATH ridership growth. More people riding transit is beneficial for communities, who experience decreased congestion and pollution, riders, who experience increased quality of life, and real estate developers, who can price their transit-proximate developments at a premium. Developers can charge a premium because the presence of transit makes the land surrounding it more valuable, and this value increase can be tapped to fund capacity upgrades that enable transit to accommodate growing ridership. Hong Kong is often cited as a model for using the real estate surrounding transit to generate income that is used to maintain and improve transit infrastructure. In New York, former Mayor Michael Bloomberg’s administration funded an expansion of the New York City Subway to the new Hudson Yards neighborhood taking shape on Mahanttan’s far west side by issuing bonds backed by future tax revenues from a special district encompassing the boundaries of the new mixed-use development. Cities are using a range of innovative public financing tools to fund infrastructure, including Tax Increment Financing, creating Special Assessment Districts, Joint Development, and Transit Impact Development Fees, but success requires cooperation between the real estate industry, local governments, and transit agencies. 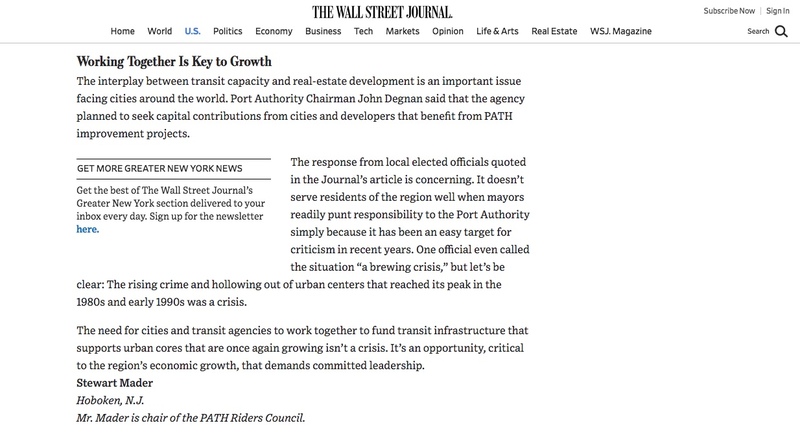 I wrote an Op-Ed in the Wall Street Journal in June, 2016, Working Together Is Key to Growth, calling on elected officials to show leadership on this issue, which is critical to our region’s continued economic growth. As Chair of the PATH Riders Council, I established a Vice Chair, Access position to focus on access issues for PATH riders. I also advised PATH on customer communication and messaging for the installation of an elevator at Grove St. station, a key project to increase ADA compliance and improve access for customers in Jersey City. New York has fallen behind its peer cities in a critical area: fast, efficient, and direct rail connections to airports. Extending PATH to Newark Airport, which is currently in the planning process, would dramatically improve airport access for the NYC region, and better connect Newark’s South Ward to the educational and economic opportunities afforded by good transit. Extending PATH would improve access to Newark Airport and the city’s South Ward, and improve Hudson transit resilience. Over the past several years, the PATH Riders Council and PATH have worked together to build a strong working relationship based on collaboration, openness, and trust. While PRC is separate from PATH, the council members and PATH staff approach our relationship as colleagues whose shared goal is to ensure transit is safe, convenient, and customer-friendly. In a profile of PRC by Portfolio, the Port Authority blog, key PATH personnel spoke highly of the relationship with PRC, including Mike Marino, General Manager/Director, and Jessica Mills, Manager of Marketing and Customer Service. To prepare for the addition of PRC’s first new class of members in late 2017, I led creation of the PRC Briefing Book, which contains key information for PRC members on PATH’s history, operations, and organization, as well as details on key PRC initiatives. The book will be updated as the council’s work progresses, and is intended to help new PRC members get up to speed quickly, so they can contribute to the council’s ongoing work with PATH. PRC Briefing Book cover. The PRC Briefing Book helps new members get up to speed quickly, so they can contribute to the council’s work. PATH is one of only six U.S. rapid transit systems that operates 24/7 service, alongside the New York City Subway, Staten Island Railway, PATCO, Chicago L Red and Blue Lines, and the Minnesota METRO Transit Green Line. In 2014, a panel created by the governors of NY & NJ recommended eliminating overnight PATH service as a cost-saving measure. PRC opposed this proposed service reduction, and I shared criticism of the idea in an interview with PIX11 reporter Greg Mocker. The idea was tabled by then-Chair John Degnan, who assured lawmakers that no service reduction would be enacted without public consultation.